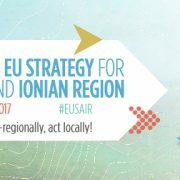 The 2nd Forum of the EU Strategy for the Adriatic and Ionian Region (EUSAIR) will take place in Ioannina (Greece) on 11-12 May 2017. The speakers of the conference will be, among others, foreign ministers, national authorities, responsible for managing EU funds as well as representatives from the EU. The conference will offer plenty of opportunities to meet and discuss with people, coming from public administrations, business sector, academia and civil society at large. Registration will be open till 3 May 2017.